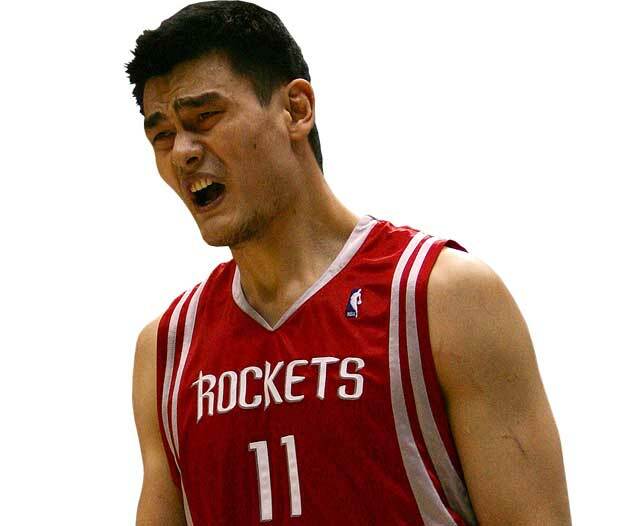 Yesterday was another slow sports day at the Complex HQ, until we heard the sad and shocking news that Yao Ming&apos;s foot injury may be potentially career-threatening. Yao broke his left foot last month in the Western Conference semifinals against the Lakers, and apparently it&apos;s been slow to heal. Now his team physician is saying "the injury has the potential for him missing next season and could be career-threatening." Yao-ouch! • Back in 1991, Bo Jackson was an All-Star major league baseball player, all-world NFL running back, and general pop culture icon when he suffered a devastating hip injury in an NFL playoff game. He developed avascular necrosis (a disease restricting blood flow to an area of bone) and eventually had to have the hip replaced. Although he would never play football again, Bo returned to baseball in 1993, winning the Comeback Player of the Year award, but he would retire the next season. • Williams was the no. 2 pick in the 2002 NBA Draft (behind Yao) and was one year into what seemed like a promising pro career when he was in a serious motorcycle accident prior to the &apos;03-&apos;04 season, severing a nerve in his leg and tearing major ligaments in his knee. He was eventually waived by the Chicago Bulls and attempted a comeback with the Nets in 2006 before retiring. • In 1967 Conigliaro was selected to the All-Star Game and became the youngest player in history to reach 100 home runs when he was hit in the head by a pitch, breaking his cheekbone and damaging his retina. After missing the rest of the &apos;67 and &apos;68 seasons, he won Comeback Player of the Year in &apos;69, but after another fine year in &apos;70, Conigliaro was unable to maintain his success, retiring after an aborted second comeback in 1975. • A center for the Colorado Avalanche, Moore never played another game after being punched in the back of the head by Vancouver Canucks defenseman Todd Bertuzzi. After a series of incidents between the two teams in the &apos;03-&apos;04 season, Bertuzzi laid out Moore with a blind cheap shot, resulting in three cracked vertebrae and a concussion. Bertuzzi was suspended for the remainder of the season and subsequently sued by Moore, who still suffers from post-concussion syndrome. • Before Barbaro and Eight Belles exposed the sad side of horse racing, Ruffian shattered her right leg in a 1975 "Battle of the Sexes" match race against that year&apos;s Kentucky Derby winner, Foolish Pleasure. A filly, Ruffian was undefeated in 10 races prior to running against Foolish Pleasure. She was leading the race against the favored colt when two bones in her right leg snapped; she was operated on for three hours, but awoke from the anesthesia thinking she was still running and subsequently had to be euthanized.